(Nanowerk News) A stark and troubling reality helped spur Juan Hinestroza to what he hopes is an important discovery and a step toward cleaner manufacturing. Hinestroza, associate professor of fiber science and director of undergraduate studies in the College of Human Ecology, has been to several manufacturing facilities around the globe, and he says that there are some areas of the planet in which he could identify what color is in fashion in New York or Paris by simply looking at the color of a nearby river. “I saw it with my own eyes; it’s very sad,” he said. Some of these overseas facilities are dumping waste products from textile dying and other processes directly into the air and waterways, making no attempt to mitigate their product’s effect on the environment. Hinestroza is hopeful that a technique developed at Cornell in conjunction with former Cornell chemistry professor Will Dichtel will help industry clean up its act. 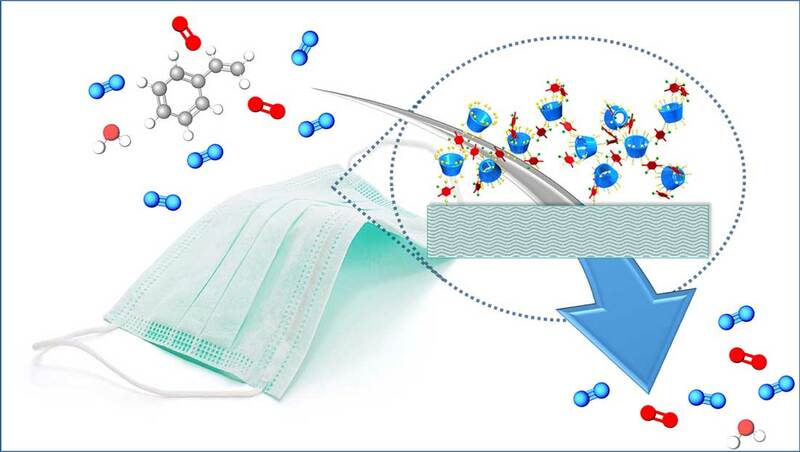 The group has shown the ability to infuse cotton with a beta-cyclodextrin (BCD) polymer, which acts as a filtration device that works in both water and air. Their work is detailed in a paper published online Oct. 24 in Chemistry of Materials ("Cotton Fabric Functionalized with a β-Cyclodextrin Polymer Captures Organic Pollutants from Contaminated Air and Water"). First author Diego Alzate-Sánchez and Dichtel are now at Northwestern University. Other contributors are former postdoctoral researchers Brian J. Smith (now an assistant professor at Bucknell) and Alaaeddin Alsbaiee (now at Arkema Inc.). Cotton fabric was functionalized by making it a participant in the polymerization process. The addition of the fiber to the reaction resulted in a unique polymer grafted to the cotton surface. Scanning electron microscopy showed that the cotton fibers appeared unchanged after the polymerization reaction. And when tested for uptake of pollutants in water (bisphenol A) and air (styrene), the polymerized fibers showed orders of magnitude greater uptakes than that of untreated cotton fabric or commercial absorbents. Hinestroza pointed to several positives that should make this functionalized fabric technology attractive to industry. Hinestroza said the adsorption potential of this patent-pending technique could extend to other materials, and be used for respirator masks and filtration media, explosive detection and even food packaging that would detect when the product has gone bad. And, of course, he hopes it can play a role in a cleaner, more environmentally responsible industrial practices.